The Native American Dollar coin series launched in 2009 to honor the contributions and accomplishments of Native Americans. Each year, a unique reverse design representing a different theme has been paired with the popular obverse design featuring Sacagawea. The reverse design for each year is to be emblematic of one important Native American or Native American contribution. To the extent possible, the design themes are to be issued in the chronological order in which the Native Americans lived or the events occurred. The themes to be depicted as well as the actual designs are selected by the Secretary of the Treasury following consultation with the Committee on Indian Affairs of the Senate, the Congressional Native American Caucus of the House of Representatives, the Commission of Fine Arts, the National Congress of American Indians, and review by the Citizens Coinage Advisory Committee. 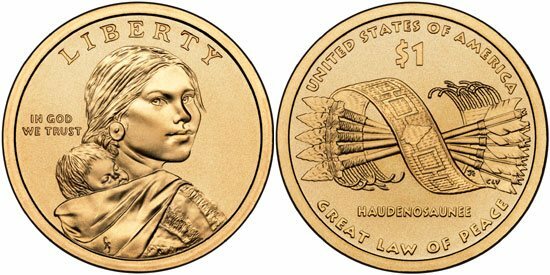 The obverse design for each year of the series has featured the portrait of Sacagawea and child originally designed by Glenna Goodacre for the previous Sacagawea Dollar series. For the current series, the design was slightly modified by moving the inscriptions of the date and mint mark to the edge of the coin where they appear along with the motto “E Pluribus Unum”. Native American Dollars have been issued alongside the Presidential Dollar series, which features four different designs per year honoring the former Presidents of the United States. Legislation requires that each year at least 20% of all dollar coins produced must carry the Native American Dollar designs. This requirement has had a significant impact of the mintage levels throughout the series.